Have you considered including Habitat in your will or estate plans? When you make a gift to Habitat for Humanity of Orange County, NC, you become an integral partner in the mission of building strength, stability and self-reliance through shelter. 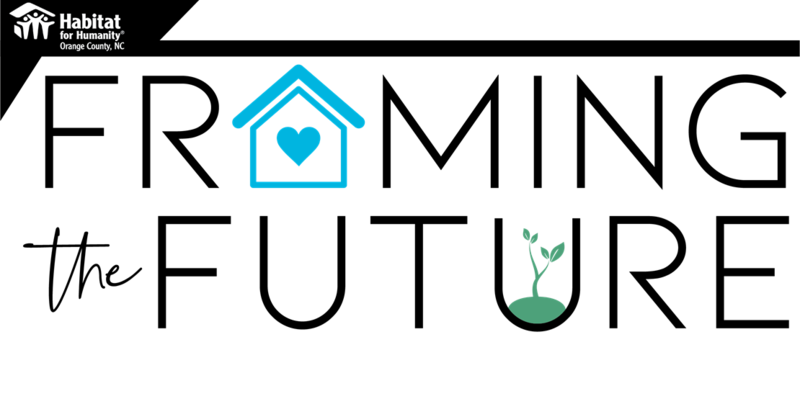 We know that safe, decent and affordable housing plays a critical role in enabling families and individuals to realize new lives filled with possibilities and progress. With just a little help, Habitat homebuyers are able to obtain the confidence and self-sufficiency they need to invest in themselves and their communities. These outcomes are most often long-lasting and change the lives of multiple generations of a family. You can partner in empowering families and individuals with a gift that has an impact now. You can make a gift in your will, trust, or other account that becomes your personal legacy of changing the world through shelter. A legacy gift will ensure that your critical support will continue to help more local families and individuals build stable futures for years to come. Most gifts cost you nothing now and many gifts even pay you income. You are not obligated in any way when you give; you can change your beneficiaries any time. We hope you'll join us in extending a hand up to families and individuals to a better, brighter future through homeownership. 1. Meet with your estate planning attorney- Whether you need to create a will or simply update an earlier version, we recommend seeking the help of an estate planning attorney and tax advisor who can ensure that your will is legal and executable. 2. Choose how to give- Figure out the way to give that works best with you. Different ways include gifts that cost you nothing now and gifts that may pay you income. 3. Let us know of your plans- Please contact Janice at jkalin@orangehabitat.org or 919-932-7077 ext. 218 to let us know when you have named Habitat for Humanity of Orange County, NC as a beneficiary of your estate. We would love the opportunity to thank you for such a special commitment and recognize you in the Habitat Legacy Society. 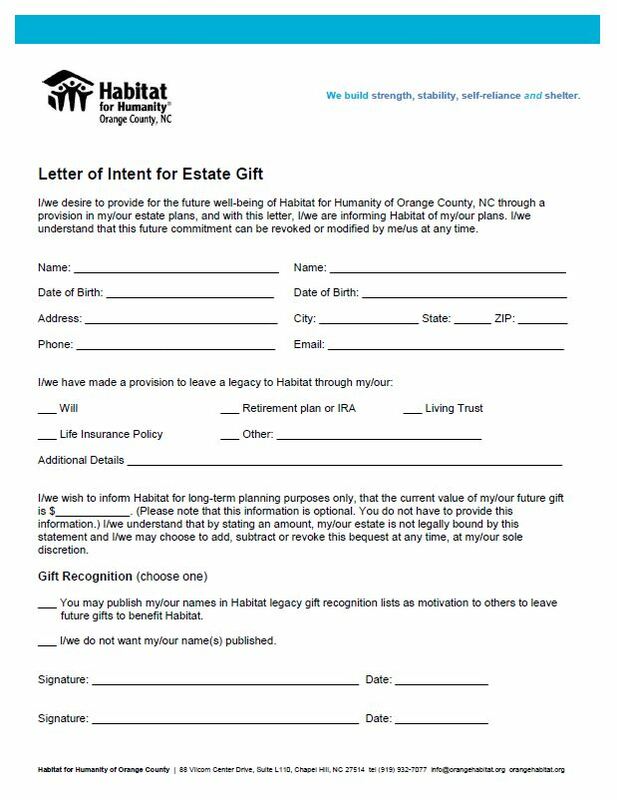 Simply complete this form to let us know that you have included Habitat for Humanity of Orange County, NC in your estate plans. Habitat for Humanity of Orange County, NC operates separately from Habitat for Humanity International. 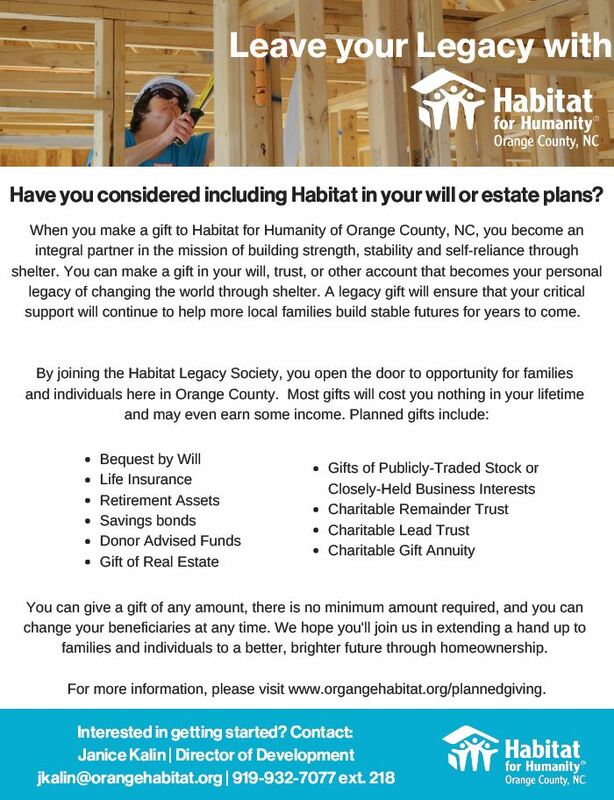 To ensure your gift stays in Orange County, make sure you specifically mention Habitat for Humanity of Orange County, NC in your official documentation. Habitat for Humanity of Orange County, NC's tax ID number is 58-1603427. This information is not intended to be tax or legal advice. Please seek assistance from a professional in designing your planned gift. After providing for your family, we hope you will consider a legacy gift that makes supporting families and individuals working toward independence a part of your life story. A legacy gift is not only cost-free during your lifetime, but also lasts another lifetime for a Habitat homebuyer. It would be our distinct honor to welcome you to the Habitat Legacy Society. By making a permanent gift to Habitat through your will, trust, or beneficiary designation you ensure that our partnership will endure long after your lifetime until our shared vision is realized and everyone has a decent place to live. “I want to ensure that Habitat will be able to continue building foundations for families and communities beyond my lifetime. Habitat can give you the tools to move your legacy forward." - Habitat Wednesday Crew and Legacy Society Member Rick Tugwell. Thank you to the following donors who, over the past 30 years, have provided over $985,000 in planned gifts to Habitat for Humanity of Orange County, NC. As a result, 12 families have received a hand up into safe, affordable housing.